Leaving a dock door open all day is an invitation to have someone stroll your aisles, check out your inventory, and perhaps take something. Most busy operations, particularly in good weather situations, leave those doors open. Often, the crew is busy with actual work; they don’t have the time to monitor visitors, delivery drivers, service providers, and every other person who strolls in. One way to do this (and still get some nice spring air in the dock door) is to utilize folding security gates. They’re relatively inexpensive and easy to install. If you do keep the actual dock doors closed, what about your personnel doors? Driver Security Cages (also called man traps, dock cages, and partitions) are an excellent way to allow visitors access to the warehouse without allowing them access to your entire inventory. You have to admit them into the building, but they aren’t allowed to simply come in, hit the coffee pot, and maybe get too good of a look at your inventory. Visitors can enter the door, but can’t get out of the cage itself, which allows you to decide who to admit, and when. 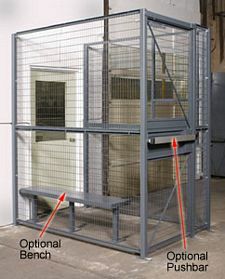 Customize these cages with service windows, benches, push bars, ceilings, and more to make the job or monitoring and controlling guest access easier. If your facility isn’t designed to control visitor traffic, truckers, salespeople, and others can easily walk all through the warehouse. Everything along these routes is at risk, and the safety of those guests may also be threatened as they aren’t aware of your procedures. People simply should not be able to wonder through these areas unless cleared by your personnel. If you can’t or don’t want to cage the doors so access is permission-only, lay out your warehouse to move visitors or guests to a lounge area without any access to inventory. If not, strictly instruct them on where they are expected to walk through your facility – and make sure they stick to it.